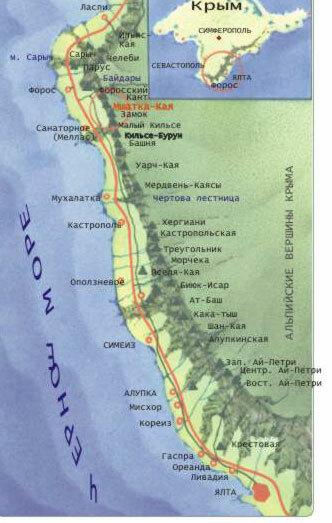 Mshatka-Kaya is situated in the south-western part of the Crimean coast, to the north-west from Sanatornoe village, and it is well seen from the road Sevastopol-Yalta. 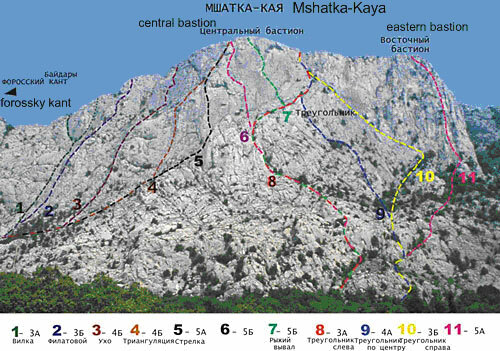 Most popular are the routes of the western part of the massif «Вилка» (Vilka), «Филатовская» (Filatovaskaya) and «Ухо» (Uho). Most difficult routes are on the central bastion, made by YU. Lishaev ("Fantik") alone. Approach to the routes №1-№5 begins from an old road near the alpinist camps under Forossky Kant, and to the routes №6-№11 y can go approximately 100 m to the east from the fork of the old road to the main road and Foros. You can descend from the summit approximately in an hour, moving westwards along the marked path, descending to the old road above the Foros church. Below you can see the deions of several most popular routes on Mshatka- Кaya from west to east . In brackets there are names, given to some of these routes by their first ascenders and beta. Approach to the route begins from the upper road 50 m below the alpinist camps under the central part of Forossky Kant. Go upwards and a bit to the left firstly by the path, then by easy rocks to the wide corner, which cuts all the wall of the massif (R0: 300m, 45 0, б / к). On the section R1-R2 – go upwards firstly on the left by the 20-meter corner to the big trapeziform ledge, then by the vertical wall to the tree (R1-R2: 40m, 65 0, III+). On the sections R2-R4 firstly go upwards by the nail slabs of the wide corner to the base of a small gutter washed by water. Then go to the left and upwards by the walls to the small tree under the pre-peak tower. Here the route bifurcates and goes along the left or the right inclined corners, separating the pre-peak tower from the wall (R2-R4: 100 m, 60-70 0, -III). The left variation : Go upwards and to the left by the long inclined left corner Bypassing the tower. Then move by the ledges and inclined slabs to the left and go upwards to the plateau (R4-R5': 40 m, 75 0, III+ R5'-R6': 40 m , 65 0, -III R6'- peak: 40 m, 65 0, II). The right variation : On the section R4-R5” – go to the right and upwards by the abrupt slabs to the group of trees (R4-R5”: 40 m, 75 0, +III). On the section R5”-R6” go upwards and to the right to the couloir, turning into the inclined corner (R5”-R6”: 80m, 65 0, -III). On the last section go upwards and to the right by the slabs to the plateau (R6”-peak: 40 m, 60 0, II). Time of the route is 2-3 hours. This is one of the most popular routes among the middle qualification alpinists. Approach to the route begins from the upper road 50 m below the alpinist camps under the central part of Forossky Kant. Go upwards and to the right firstly by the path, then by easy rocks to the direction of the first buttress of the western part of the massif. The main part of the route starts from the horizontal ledge at the foot of the left side of the buttress (section R0: 300 m, 45 0, б / к). On the section R1-R2 go 15 m upwards from the corner to the ledge with a tree. Then go firstly by the wall, then go to the left and upwards to the tree ( R1-R2: 15 m, 70 0, II 25 m, 75 0, III). On the section R2-R3 go 35 m upwards by the couloir to the tree, growing in the base of the chimney (R2-R3: 35 m, 50-60 0, II). On the section R3-R4 go upwards firstly 8 m by the chimney and then by easy rocks go to the ledge with a tree. The chimney can be bypassed on the right by the abrupt walls (R3-R4: 8m, 90 0, IV 32m, 65 0, II). On the section R4-R5 go 40m upwards by the buttress to the abrupt wall with a tree in the middle. The section R5-R6 is a crux. 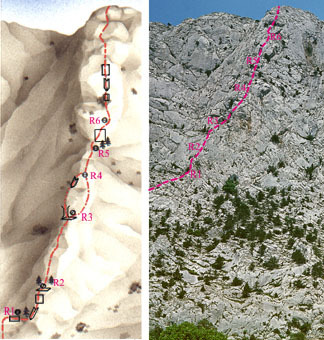 Firstly go upwards by the abrupt wall to the big pine-tree Then go upwards by the vertical 10-meter crack, and then go to the ledge with trees ( R4-R5: 40 m, 60-70 0, II R5-R6: 20m, 75 0, IV 10m, 80 0, V 10m, 50 0, I ). 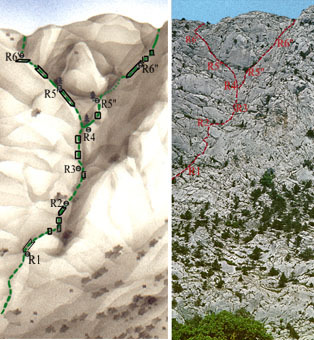 On the last section go upwards by the buttress and easy rocks ( R6-the plateau: 100m, 50-60 0, I-II ). The ascent takes 2 – 3 hours. Length of the main part of the route is about 300m. Elena Filatova together with her friends made many ascents in Crimea . 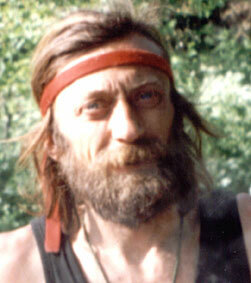 She died in 1973 in avalanche while ascending in the Western Caucasus. Brothers Alexander and Vasiliy Volkodav, active alpinists of Dnepropetrovsk club “ Буревестник ” 60-70. they were among the first explorers of the routes in Crimea and made many interesting first ascents.